"She still thought Gene posted that picture today. When he did not. ".....oh yes he did!!!! Just to confirm....Gene DID indeed post this comment and picture on Twitter on June 24th this year. I'm not saying he didn't post the picture previously (if he did, I didn't see it!). Gene's Tweet and the picture of Jimmy/Nick are date-stamped as "7.16am 24 Jun 13" - see his Twitter feed. Looks like Genie pulled out the pic from the archive and re-posted lol....he's such a self-glorifying tart lol, but I love him ! No worries, happy to have you adding to the thread. I've found the link to the original tweet, and Gene has deleted it. 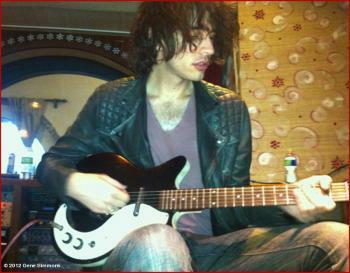 November 6, 2012 The young man, Nick Simmons, playing Jimmy Page's guitar (!!!) used on Led Zep II for an as-yet unofficial studio venture. Stay tuned. Now it's Gene Simmons, so a pinch of salt is required. 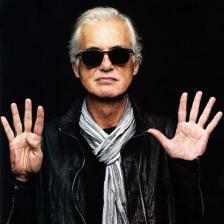 This must have been around the time of the NYC Celebration Day press conference. 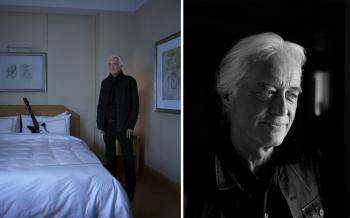 The guitar in the photo is the same one that is in the bed in the Esquire Magazine photo. I've attached a high-resolution version of the Esquire shoot (with a previously-unpublished photo) so you can see the guitar. It looks like it's in a home studio too. Very weird. PMSL...."Now it's Gene Simmons, so a pinch of salt is required".....so true lol !!!! On a further KISS/Led Zep connection, Ross Halfin posted some time back that Paul Stanley and Jimmy went out for dinner in London (maybe to Nobu? )....If memory serves correct, Ross said something like "the paparazzi went crazy" when they left. Has anyone ever seen any of these pics anywhere? 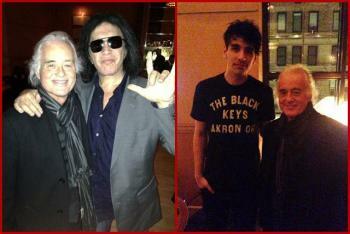 Had dinner this evening with Paul Stanley and Jimmy Page. We went to Nobu - the paparrazi outside had a field day. Janet Jackson was at the next table eating a bucket of KFC with rock shrimp tempura, which looked like chicken nuggets. She caught Paul's eye who went and said hello and introduced Jimmy to her - they are now doing solos on her new version of Beat It. They all chatted and the best part was she didn't ask how Gene Simmons was or talk about how Gene was bigger than the Beatles. Paul treated us to dinner, and Dragan and Mee Ok looked after us. It was a chilled rock star evening, extremely pleasant. I've never seen the photos from that day actually. Looks like our Mr. Page is everywhere! An Adam Ant film premier?? Awesome, looks cool. I think the film was supporting his new album. 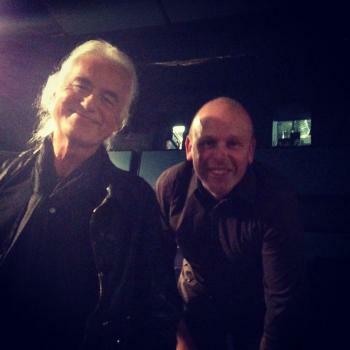 Talking about Jimmy being at the Adam Ant film premiere, here's a link with a photo. 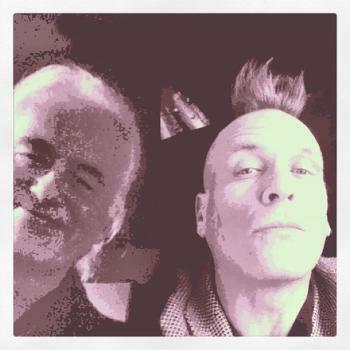 john robb ‏@johnrobb77 26 Jun I met Jimmy Page at the Adam Ant film preview...talked about Adam, Killing Joke, Stone Roses and how he liked my TV stuff. Top Bloke. This photo is fake, it's the other photo of Jimmy at the night, cropped and distorted. Really, James? I had no idea who this guy John Robb is, so when I googled him, it appears he is a journalist. Are you saying that he has just taken the photo, distorted it and put it on his Twitter Account. Does that mean the account of meeting Jimmy there is possibly fake too? I am getting a bit confused with this one. Yeah, he faked meeting Jimmy for some reason. Thanks, Cookie. What a saddo this guy must be. The comments he made at the bottom of the photograph now sound like a case of self promotion. From the look of this guy, he is a bit long in the tooth for playing that kind of stunt. Suuuuure creepy Mohawk guy. You met Jimmy, the photo is real; in fact I will ask Jimmy about it when he comes over for dinner tonight. So, are we to believe that he met JImmy, but a mate edited the photo. What a load of BS. Make sure Jimmy does the washing up at the end of it all. If he doesn't, you will make him stay in the spare room. According to Cookie0024's excellent Twitter page 'LedZepNews', Jimmy is at the London Film and Comic Convention. "Today Jimmy Page is at the London Film and Comic Con at Earls Court 2 http://www.londonfilmandcomiccon.com "
Thanks for sharing this, though the link to the event won't open. I am sorry though to hear he is grumpy and misreable today from what Cookie has been told. Don't want to make light of it but I'd be miserable too if I were him. The Stones are playing Hyde Park and Jimmy's at a nerd-fest like Comic-Con? Why on earth would he be there, maybe bringing one of his kids? I actually wondered why too, once I found out what this really was. Note to Kenog - I have an update to a question you asked me, if you want to PM me. Great picture. I hope he did. I love thought thought of him shopping there. I have been to that Whole Paycheck, I mean Whole Foods. Does anyone know if he was at the Stones concert last night? He goes every year with Ross Halfin. It's a combined film and comic event, they go to check out the vintage film posters for sale. I can picture that. Thank you. Yes, that has been covered on this site in previous years. However, can you expand at all on the "grumpiness" aspect - were people going up to him to talk and getting a less than friendly response? He must get browned off at times. Yeah, people talked to him and he brushed them off. Which, to be fair, he is totally allowed to do.